Reflection Bay Golf Club is the first resort golf course in Nevada designed by Jack Nicklaus. The 7,261-yard, par-72 Jack Nicklaus Signature Golf Course makes its way through the desert while providing breathtaking views of Lake Las Vegas. Sculpted from the terrain’s natural contours with strategic bunkering and pristine greens, course highlights include three waterfalls and plays around arroyos and water. 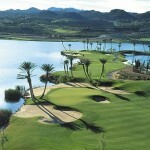 Five holes are located along one and a half miles of Lake Las Vegas’ majestic shoreline. Reflection Bay was named to Golf Magazine’s “Top Ten You Can Play” list, Golf Digest’s “Top 100 Public Golf Courses” and “Best New Upscale Public Course” lists as well as Golf for Women’s “50 Best Courses for Women.” Additionally, Reflection Bay is home to the Flick Game Improvement School. Reflection Bay is one of a handful of courses in town that is on everyone’s must play list of Las Vegas Golf Courses. This course provides an excellent golf course, conditions, and service levels to each and every guest visits. Book Reflection Bay Golf Club Now! 2019 Maintenance Schedule: Greens aeration 4/2-4/3 & 6/9-6/10.